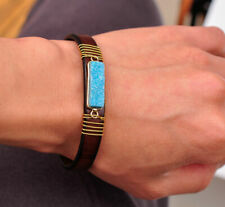 DIY Craft Natural Druzy Turquoise Genuine Leather Bracelet Cuff Wristband Brown. DIY Craft Natural Druzy Turquoise Genuine Leather Bracelet Cuff Wristband Orange. Color: As Picture. Quantity: 1Piece. Bead size:8 mm. Material: Stone. it is safe and convenient to both parties. Material: Turquoise. Bead size:8 mm. I will do my best to solve the thing about the item. it is safe and convenient to both parties. DIY Craft Natural Druzy Turquoise Genuine Leather Bracelet Cuff Wristband Black. Product code: Beaded Bracelet Product packaging: OPP Quantity: 5 Pieces Color: Multi-Color Bracelet Size: about 6.5in-7.5in. DIY Craft Natural Druzy Turquoise Genuine Leather Bracelet Cuff Wristband Red. Turquoise Natural Druzy Quartz Black Leather Bracelet Cuff Wristband Bangle Mens. Turquoise Natural Druzy Quartz Red Leather Bracelet Cuff Wristband Bangle Mens.